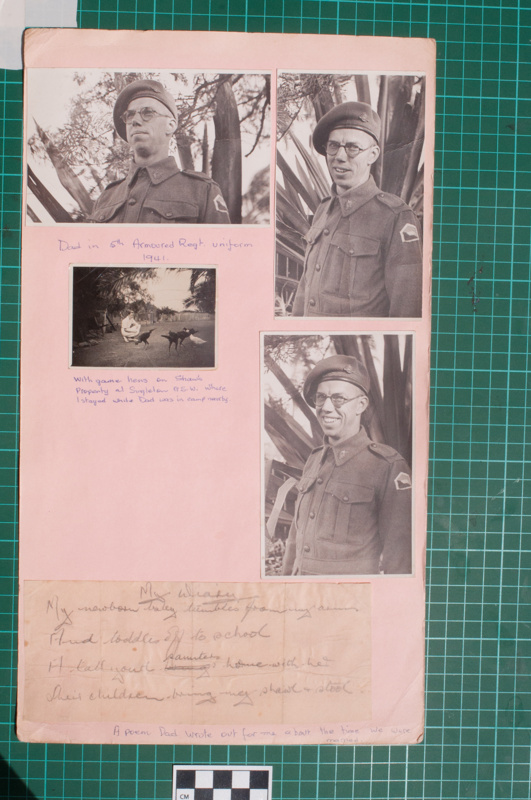 Four photographs and one document mounted on a pale pink foolscap card with handwritten annotations in blue ink below. Described from top to bottom, left to right. Top left and right, middle right: A series of three photographs of Robert Johnstone Donaldson IV (b. 1910 d. 1992) in his Second World War uniform. 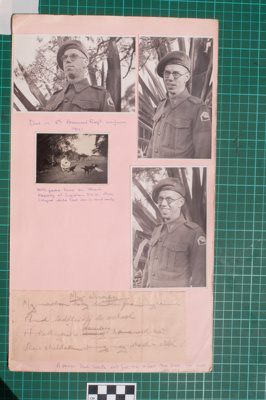 The caption reads: Dad in 5th ARmoured Regt uniform 1941. Robert served in Queensland, NSW and Western Australia over the course of the war, obtaining the rank of Warrant Officer II by the end of the war and working in the interim army at Bulimba, Brisbane after discharge. The photos were probably taken at Robert's parents' house, Oronsay, in Hendra. Middle Left: A photograph of Gwenda Elizabeth Donaldson (nee Laughton b. 1915 d. 2010) kneeling in a garden with black game hens in the foreground and a white duck The caption reads: "With game hens on Shaw's property at Singleton NSW where I stayed while Dad was in camp nearby." After some time at Groveley, the 2/5th Armoured Regt was moved to Greta, NSW in October 1941 and then to Edgeroi, NSW. Singleton is less than 30kms from Greta and the Shaws were friends of the Donaldson's according to Gwenda's autobiography "The Family Story". She describes it in the following way: "They lived on a big property outside the town and the daughter of the house bred ducks and fancy chickens. For breakfastwe had boiled rive and stewed quinces (grown on the property) follow by poached duck eggs." Bottom: A hand written document in pencil, captioned "A poem Dad wrote out for me about the time we were married." The poem reads: My Diary | My newborn baby tumbles from my arms | And toddles off to school | A tall youth saunters home with her | Their children bring my shawl and stool. The poem appears in several US Newspapers from the 1930s and 1940s and is attributed to one Martha Berndtson.